Sellout. It’s how purists attack artists whose appeal transcends the select few to find acceptance and appreciation among the masses. Jazz seems stuffed with purists. Their logic seems to say that jazz cannot be appreciated by the masses and, if it is, it’s not jazz at all. If so, German saxophonist and bandleader Max Greger (born April 2, 1926, in Munich, Germany) is the king of sellouts. He formed one of the most popular of all dance bands in Europe in the 1950s, discovering a successful formula for mixing pop, jazz and swing tunes with a groove that made people want to move. His bands always featured some of Europe’s best and best-known stars from the jazz constellation, including Dusko Gojkovic, Claus Ogerman, Benny Bailey, Charly Antolini, Don Menza and Pierre Favre. The music, while always catchy and easy to keep up with, maintained firm roots in the jazz tradition, a component that dates back to the American bands of Benny Goodman and Greger’s hero, Glenn Miller. Greger was always considered the funkier counterpart to Germany’s other band leaders that included James Last, Bert Kaempfert, Horst Jankowski, Kurt Edelhagen and Roberto Delgado. There’s no doubt that it’s all in his swing. Man, does he swing. Just listen to the way he plays tenor. He’s a Teutonic Texan at heart, with a growl that would make Basie – even Louis Armstrong – proud (Greger has, of course, performed with Armstrong). This collection gathers 18 evergreens Greger recorded with his Tanzorchester between 1965 and 1973, capturing a moment in time when many other jazzers took Greger’s idea of adapting pop music to jazz contexts. The Beatles get heavy treatment, of course (“A Hard Day’s Night”, “We Can Work It Out”, “Eight Days A Week” and “I Feel Fine”), but chances are you’ve never heard them groove like this before. We also get a taste of Greger’s imaginative way with a tune in the surprising and exceptionally fun covers of The Sweet’s “Little Willy” and the little-known Wings single, “Hi Hi Hi”. Greger’s best-known song, “Big Train,” the theme to the sketch comedy show of the same name which ran on BBC-2 from 1998 to 2002, is also here. Special mention should be made of the inventive and soulful arrangement Dieter Reith gives to Jimmy Forrest’s Ellington-derived “Night Train” heard here and while the brilliant “Soul Breeze” has rightly become a break-beat hit, one could easily presume that “Soul House” will get its discovery from its presence in this collection. 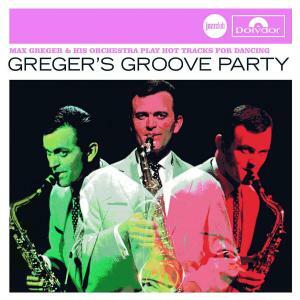 All in all, it’s a great party and a perfect introduction to the miles and miles of groove Max Greger has laid down over the years – right at a time when so many people may have forgotten that jazz was meant to be fun. Selling out never sounded so good.